I’ve been the fortunate recipient and witness to many kind acts. For each I am grateful. These kind acts take place everyday, everywhere and occasionally these kind acts are captured on film, forever recorded to be shared as a reminder of what is good in the world. At a time when many are losing hope, when the media often chooses to focus on the negative, the bad, the dark and the dirty. Leave it to one of New York’s finest to remind us of the good, Larry DePrimo has done just that. 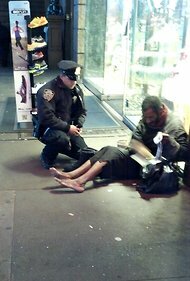 On a night so cold that officer DePrimo wore two pairs of socks and was still cold, he spotted a homeless, barefoot man in Times Square, Manhattan. It would have been easy to turn a blind eye to the poor man, after all DePrimo was on an anti-terrorist watch and had things to do. But that didn’t stop him from doing a good thing. After speaking to the man for a bit, DePrimo determined the man to wear a size 12 shoe. The heroes kind act was captured by Jennifer Foster, at the time of this post the photo had nearly a half million likes. Be sure to add yours. You can see her original photo here. Create an account at www.Americansbelieve.com and tell us about a hero you believe in.